This is the new and improved Hiblow HP120LL. This new design includes improvements for longer lasting diaphragms over the standard HP-120 model. The Hiblow HP-120LL fits many 750 Gallon Per Day units. The Hiblow HP-120LL is a compatible replacement for the Hiblow HP 120, Gast SPP-120, Thomas 5120S, Medo LA-120, Secoh EL-120, and many other 120 LPM units. Replaces Hiblow HP-120-xxxx, Thomas 5120S, Secoh EL-120W, Gast SPP-120, Medo LA-120 and Other 120 LPM units. The Hiblow HP-120LL is used on many 750 GPD and some 1000 GPD rated NSF Class 1 Standard 40 aerobic treatment systems (ATUs). The Hiblow linear diaphragm septic air pumps are widely regarded as the highest quality and longest lasting septic air pumps available on the market. They are extremely quiet and very energy efficient. The Hiblow HP-120LL can be used for septic tank aeration as well as an aerator for small ponds and water gardens. The new Hiblow HP-120LL is an improved long life version of the Hiblow HP-120. The original Hiblow HP-120 would average around 2-3 years of diaphragm life. This new and improved Long Life version should see around 5 years out of diaphragms in most applications. What is the difference between the Hiblow HP-120 and the Hiblow HP-120LL? The new Hiblow HP-120LL is an improved long life version of the Hiblow HP-120. The original Hiblow HP-120 would average around 2-3 years of diaphragm life. This new and improved Long Life version should see around 5 years out of diaphragms. Can the Hiblow HP-120LL be left out in the weather or does it need a weatherproof cover? The Hiblow HP-120LL is considered weatherproof and can be installed without a cover. However we highly recommend using an air pump housing to further protect the unit from the elements. Click here to view the air pump housing options. Does the Hiblow HP-120LL come with the fitting to connect to my alarm or control box? Yes. The Hiblow HP-120LL comes with an optional brass barb fitting that will allow you to connect a 1/8'' airline from the air pump to your alarm or control box. Does the Hiblow HP-120LL come with a manufacturer's warranty? Yes. The Hiblow HP-120LL comes with a standard manufacturer's warranty of 1 year, as well as an additonal year of coverage by Septic Solutions because this item is included in our Whale of a Deal program. 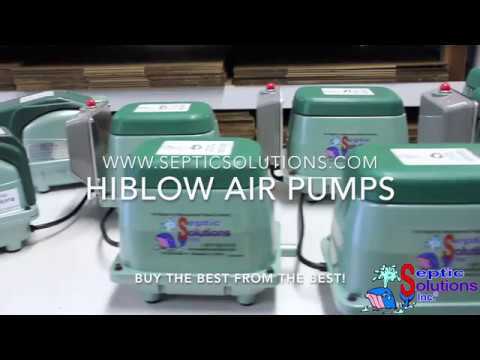 Every Hiblow HP-120LL purchased from Septic Solutions is covered under warranty for 2 years from the date of purchase. What size airline should I use with the Hiblow HP-120LL? The Hiblow HP-120LL air pump is designed to be used with 1/2'' ID airline or larger. It comes with a rubber 90 coupling connector and hose clamps.